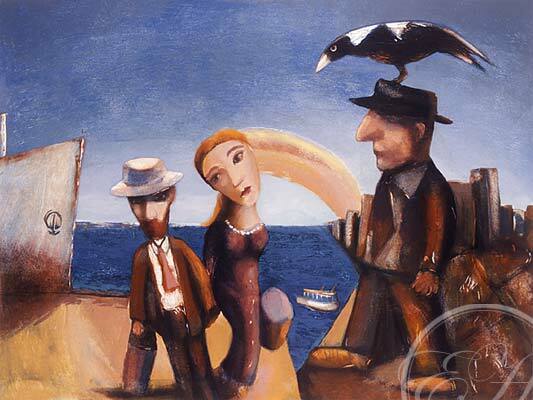 Garry Shead “The Arrival” image size of 65 x85 cm, is a Collagraph limited edition works on paper and is from his famous D.H. Lawrence series, the Arrival original Oil painting on composition board 1992 has an image size 91.5x122cm. Garry Shead D.H. Lawrence series consisted of many OIL paintings and Etching’s Circa 1992, as well as several Collagraph work’s, they are – The Supper, The Wave, Thirroul, Checkmate, Awakening and Arrival, these Collagraph’s where released in a limited edition of only 80, they have been sold out for some time, resale stock is available from time to time, these Collagraph works have appreciated in value over the past 3 to 6 years. The same titled works Checkmate, Awakening and Arrival, The Supper, The Wave, Thirroul where also done as small black and white etching’s showing Garry Shead’s incredible talent for Aquatint work, to day they are extremely hard to find, Etching House has several of these etchings which are from a private collection. Garry Shead In 1968, while on a trip to the Sepik Highlands in Papua New Guinea came across an edition of letters by D.H. Lawrence, these letters, Lawrence had written from Australia. Garry Shead’s passion for D.H. Lawrence work grew into an obsession even to the point where he reinterpreted many of Lawrence’s paintings.